This is all very true. I met some Australians while in Germany and one of the first things they asked was "So do you drink out of red cups?" Sort of flattering that the world's biggest drinkers were slightly jealous of our booze habits. I hope you're sending GFI home with several stacks of Solo cups. Maybe she can sell them and get that economy moving! Man, that is a really good idea. They're like $1.99 at Target for 30 or something. She could make fat cash AND become the American Red Cup Queen, all in one fell swoop. Did you tell them about the art you can make in chain link fences using red (and other color!) plastic cups? This seems to be particularly popular with cheerleaders. So much so that a secondary market of pre-engineered plastic inserts has emerged. "Available in a variety of colors to match your school or team colors." Though this may in fact become a fairly impressive new pixel-based art form. I foresee her going home with not only stacks of Solo cups, but also the intense beer pong training required to properly do them justice. Just imagine her hustling her hometown... You guys have your work cut out for you; good luck. A Brit Boy was visiting and jonesing to go go to American party, complete with the highly coveted Red Cups. Thankfully we were able to provide him with the real American experience. This is a revelation, TK. I find that the redcups.ie site is lacking instructional graphics showing you how you're supposed to leave the red cups EVERYWHERE around the host's apartment, filled with cigarette butts. This is an important ritual that I hope a generation of young Irishmen and Irishwomen isn't not missing out on. 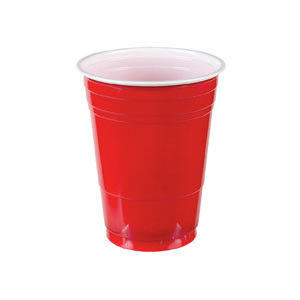 I wonder if the Irish government is considering charging a tariff on American Red Cups in order to protect the domestic plastic cup industry. They are a novelty in Australia as well - but they are limited supply! delivered all over Aus or from any Dan Murphys stores nationwide! I spend my summers in Ireland and this is very true. My friends there couldn't wait to ask me about these "American traditions." The first thing I'm asked there is, "you live in California? So you, like, know wee movie stars right?" I was just browsing the red cup images for a presentation I'm giving and came across this blog. This was very entertaining, thank you!